We honored our first black president by painting and distributing his portraits throughout the city. Our wood sculpture brought attention to the Louisiana oil spill. 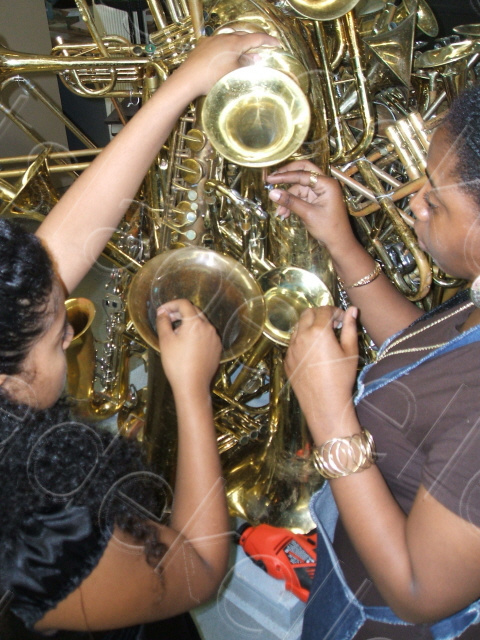 Ms. Margaret Kelley instructed ­­­­­­­­­­­­­­­­­­­­­­­­­­2010's Artists as Entrepreneurs summer program. We started this year's program with painting three beautiful pieces. First, was the creation piece, which was inspired by master artists of the 20th Century. Next was the musical piece, which was our interpretation of music in abstraction form. After we had created a Barrack Obama portrait of our first African American president, we designed and built an abstract sculpture on the oil spill and the effects it had on the animals in the Gulf and the people as well. Lastly, we ended the program building, and painting African inspired animal masks all while learning time management, budgeting, production, and the business of art." To be nourished, valued and supported is empowering. As we celebrate the 5th Anniversary of Galley East Orange, we want to thank those who support the summer arts employment program. As we flourish and grow as artists, and, as we develop our entrepreneurial skills, we will continue to make the world a better place and hope that one day we will contribute to the community that so generously provides to us. ​MJ Peterson, Director of the Division of Employment Training, East Orange, New Jersey, established Gallery East Orange in 2005. Her vision to make visual arts a part of our community was inspired by her employment experience as Director of Employment and Training for the city of Chicago, Illinois. While on a trip to New Orleans, Louisiana, she rediscovered a local artist, Margaret Slade Kelley. We use the word rediscovered because although Margaret is highly celebrated as a New Orleans artist she was born in Newark, New Jersey, spent her adult life in Orange, New Jersey, and worked for many years in East Orange, New Jersey. 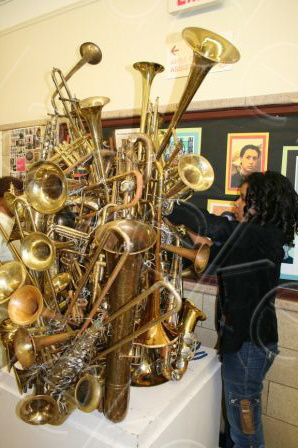 The school district sent her broken instruments and she and her students amassed an extraordinary work of art. The 5' by 5' sculpture stands over seven feet tall on its pedestal. The sculpture titled "Brazz." is dedicated to New Orleans. Four fledgling artists assisted in the construction of the work. Margaret remembers when she was one of those students. 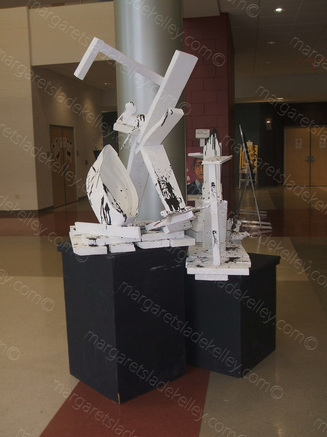 An accomplished artist Margaret Slade Kelley is an alumnus of Arts High School, which is the first school in the nation to offer the fine and performing arts as a major course of study. 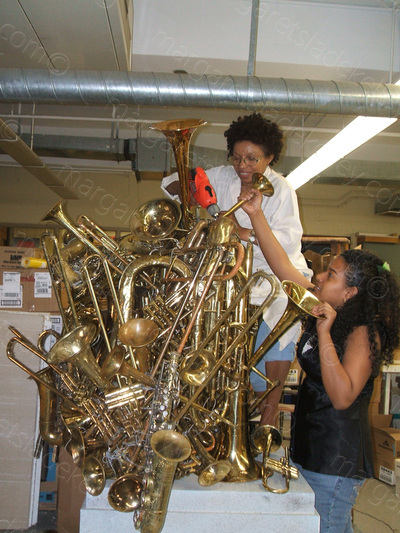 She is grateful to have had the opportunity to be nurtured in an environment that allowed her to focus on her art. Some of the graduates have gone on to reach extraordinary heights: Sarah Vaughn, Melba Moore, Tisha Campbell, and Stephen Burrows. Savion Glover and Kat DeLuna. Many others have gone on to become stars in their own communities. In addition to being the quintessential painter, Margaret Slade Kelley teaches with vigor and enthusiasm. Before Katrina destroyed their school, Margaret was head of the art department at Charter Middle School where their unique program of fine and performing arts, along with their excellent core curriculum, placed them in the top 5% of all charter schools in the nation. “Each child had the opportunity to excel, whether it be in the core academic or one of the cultural arts disciplines. ”I am convinced that when children are exposed to the arts, they develop an inner peace and a sensitivity toward the world around them. ​Today, the Charter Middle School is developing programs that will take them into the next phase of providing students with excellence in education. In May of 2015 Co-Founders Dr. Tony Recasner and Jay Altman received the One Public Education Award from the New Orleans Public Education Network.